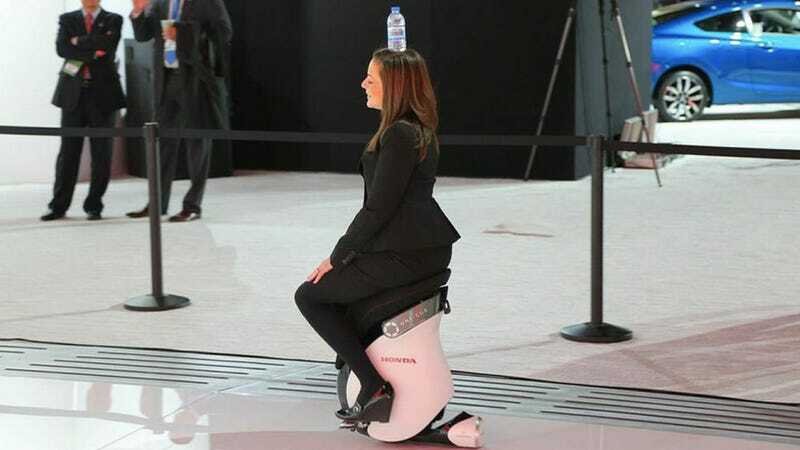 During their press conference, Honda demonstrated their UNI-CUB motorized chair-thing, which they're using to develop the world's least-efficient method of single water-bottle delivery. Seeing it in action, I'm very impressed. I'm not sure a less efficient method of delivering water is possible with today's technology. Having one person sitting on a motorized unicycle delivering a solitary bottle of water by hand is highly impractical and wildly inefficient; but having that person set the water bottle on her head ups the difficulty of the entire endeavor, and is really what makes Honda the undisputed kings of inefficient lone water-vessel transport. Fantastic work, Honda! I can't wait to almost never get my water bottle from a woman's head on a UNI-CUB!